Although lesser known to the general public than Joseph Stiglitz or Paul Krugman, Dani Rodrik is one the most prominent professors of political economy in the United States. His interventions on the evolution of the international economy are authoritative. In “Economics Rules”, Rodrik takes a break from commenting on global trends and changes in order to question the meaning of his chosen profession and discipline. This publication aims to elucidate the apparent versatility of economic science, which, according to current popular opinion, contributes to as many successes as it does failures when it is applied to way in which countries are run. At the top of Rodrik’s list of successes is the construction of a new international order, within the context of the Bretton Woods Conference and in less than one month, which would go on to last for more than 30 years, emerging from the collaboration between John Maynard Keynes and the head of the American Treasury, Harry Dexter White. He also cites the decisive contribution in 1997 of the economist and Vice-minister for Finance of Mexico, Santiago Levy, to the renewal of programmes for combatting poverty. The success of these programmes was a source of inspiration not only for Levy’s Central and South American colleagues, but also for the Mayor of New York, Michael Bloomberg. In recognising these two instances of rapprochement between professional economists and political powers as major successes, Rodrik places himself firmly on progressive ground. It does not mean that he considers economic debate to be limited to the affirmation of essential truths through the discovery of timeless laws. For Rodrik, if economics is a science, it is not one that postulates dogmas that would facilitate social and political polarisation. Economics arises from the elaboration and testing of models; the evaluation of these models’ efficiency depends in large part on the expectations of their users. The economist is an engineer, not a theologian nor even a physicist to whom the laws of nature are progressively revealed. In other words, not even the current intensification of the use of mathematics by economic science can be used to justify any claim to the absolute truth of its findings. 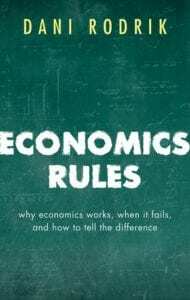 “Economics Rules” is therefore not simply an exercise in modesty from one of the discipline’s greatest practitioners; it is also a reminder to political powers and citizens alike that they are responsible for their own future.